Quesadillas are simply toasted tortillas with melted cheese and other tasty bits inside. Nothing especially complicated but I was introduced to them relatively recently. Nigella included a recipe for quesadillas in Nigella Express – her speedy recipes book which was a god send when Ted was a baby – and we’ve loved them ever since. You could fry quesadillas in a pan but for the pleasing chargrilled tiger stripes effect you will need a stove top griddle. 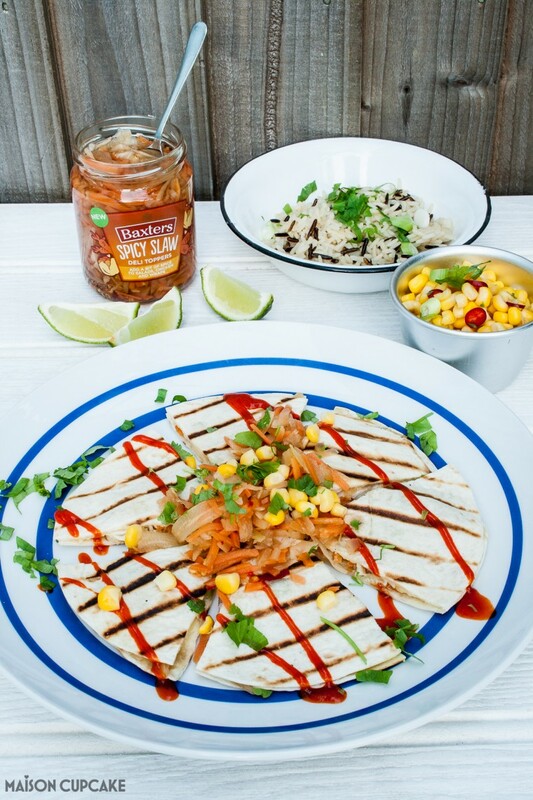 Quesadillas work especially well with chillies or pickles inside. We had a Sunday night quesadilla ritual we called “Taco Night”. Quesadillas and tacos are obviously not the same thing but it came from ABC’s Lost, our favourite TV show at the time. In a flashback to uncharacteristic wedded bliss, main character Kate told her then-husband, “it’s Taco Night”. Much amused, my husband and I adopted the phrase for ourselves – keeping the happy Taco Night tradition alive even if Lost’s poor tormented Kate could not. In the old days of Taco Night Chez Walthamstow, when we were still zombified from sleepless nights with Ted, I stuck fairly rigidly on autopilot to Nigella’s parma ham version. Having since eaten many quesadillas in Wahaca I now realise you can put whatever you like in them so long as the melted cheese holds it all together. So here is my own version featuring Baxters Deli Toppers Spicy Slaw. 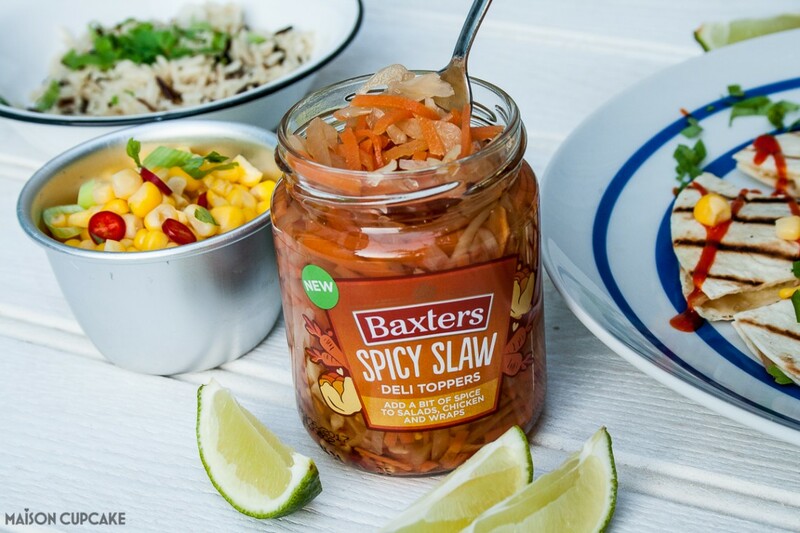 The Spicy Slaw is just one variety from the new selection of Baxters’ Deli Toppers. 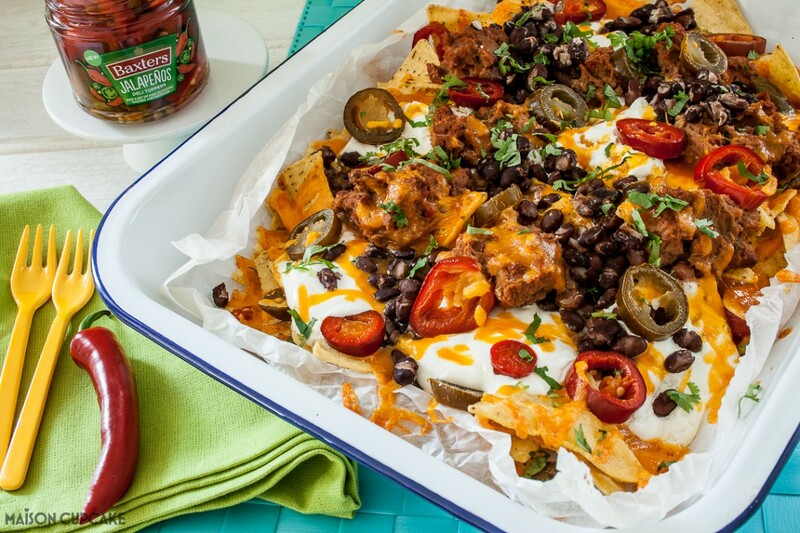 I have already featured their jalapenos in my spicy black bean nachos last week (see below) and recipes using the Red Onion Rings and Red Slaw Deli Toppers will be featured here in the next couple of weeks. As well as the chicken filling, I toasted a veggie alternative using the black beans left over from last week’s spicy black bean nachos. Both versions have the Spicy Slaw inside but you can pile extra on the side too. Quesadillas are best served hot but in common with pizza they’re rather tasty cold the next day too. Only left over quesadillas are a rare thing – at least they are in our house! Have you ever made quesadillas? Quesadillas are toasted tortillas filled with cheese and other tasty bits. They're Mexico's answer to grilled cheese sandwiches. Heat the griddle for several minutes until very hot. Meanwhile scatter half of the grated cheese on four of the tortillas. Arrange on top of this, chicken slices (or black beans), chopped pepper, a few sliced red onion rings and a tablespoon of Deli Toppers Spicy Slaw. Add green chilli if you want it extra hot. Scatter over the remaining half of the cheese and press down the last four tortillas on top. Place each filled pair of tortillas, one pair at a time, onto the hot griddle. Toast on each side for 2-3 minutes until the cheese has melted and black stripes scorched underneath. Flip the tortilla over gently with a spatula and toast the other side. 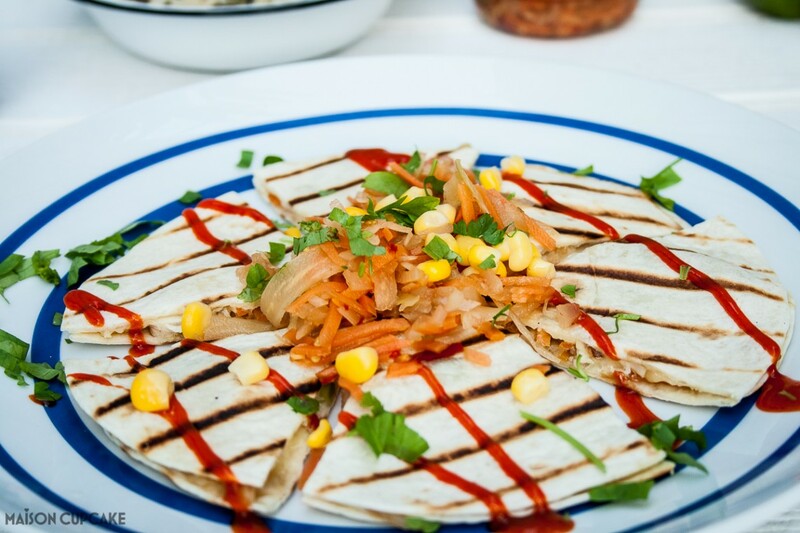 To serve, cut the quesadillas into triangles and drizzle with chilli sauce, sweetcorn and chopped coriander or parsley. 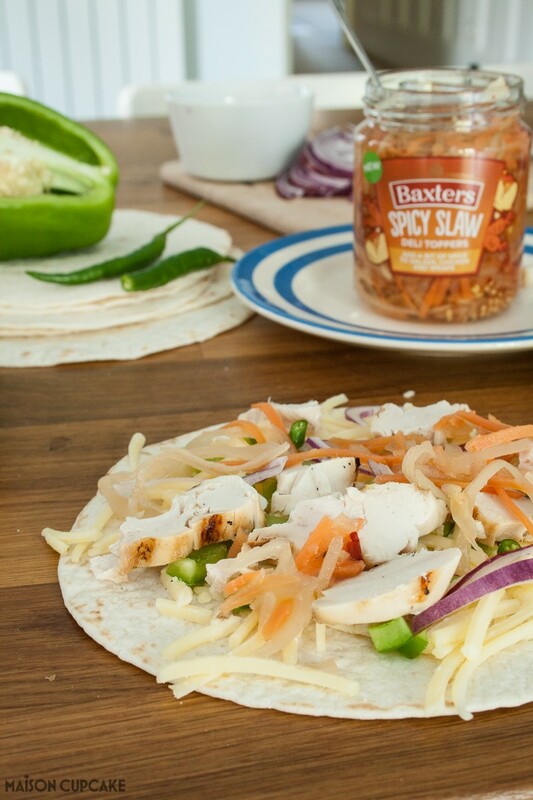 This spicy slaw quesadillas post was commissioned by Baxters as part of their new Deli Toppers #GetTopping campaign. For more recipes using Baxters Deli Toppers and the chance to grab a free jar of product visit the Deli Toppers microsite. Totally agree with you, I think anything goes in quesadillas as long a there’s melted cheese to hold it all together! These look so good and will look out for those toppers. 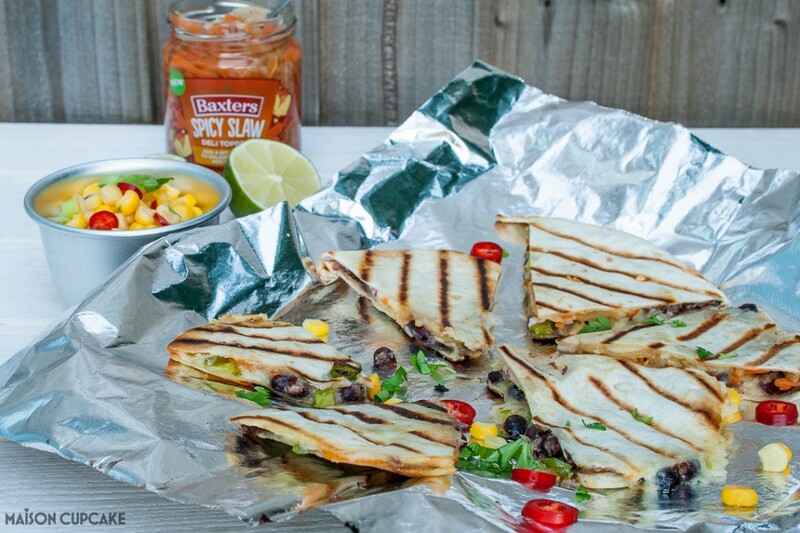 Loving the quesadillas Sarah… this is further inspiration for the boys’ packed lunches too which is mighty handy. We don’t get many leftover when we have them either tbh!!!!! Yum, these look so good! I’ve not tried these deli toppers yet but love anything pickled and spicy so will look out for them on my next shop! This reminds me how much I like quesadillas. Mine have never looked as enticing or as sophisticated as these though. A bit of spicy slaw sounds like a great addition. What a fantastic weeknight meal! Bookmarked! I had a wrap for lunch today Sarah and added some of this slaw. It has a nice kick to it. Anyhting with the word spicy in it gets my vote. 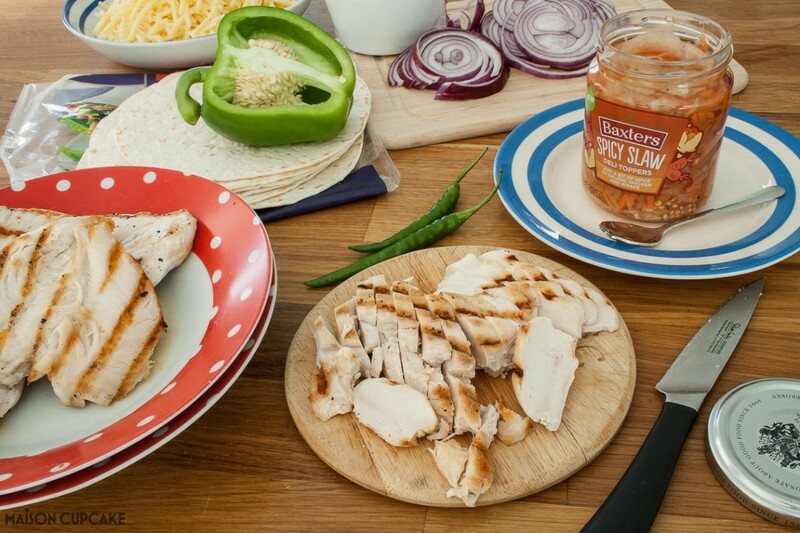 I also love quesadillas, especially with spicy chilli mayo or sauce and now I’ll have to add some spicy slaw too! Mmmm I am so loving the look of these! The Baxter’s toppers sure sound like a store cupboard essential! Looks fab and love the idea of having a themed night of the week. Wonder if the kids will like quesadillas though. Hmmm, should give it a whirl!